OU PGCET is conducted in paper-pencil mode. Candidates who successfully clear the exam can secure their respective seats at Osmania, Telangana, Mahatma Gandhi and Palamuru Universities, Post Graduate Centers, University Departments and Government aided as well as private institutes located within Telangana. 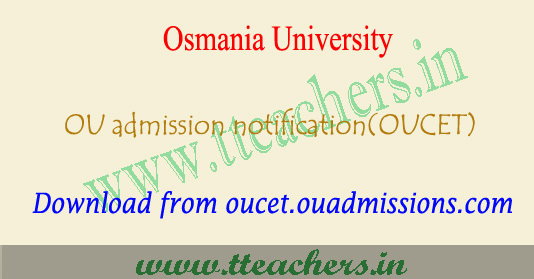 Osmania University Common Entrance Tests (OUCET) are being conducted by Osmania University for admissions into various PG, PG Diploma and 5-Year Integrated Programmes offered by Osmania, Telangana, Mahatma Gandhi and Palamuru Universities. The Directorate of Admissions, Osmania University has been successfully carrying out the gigantic task of conducting entrance tests and admissions into various courses offered by the University and its affiliating institutions since 2000-2001 academic year. The candidates can go through the official notification and find the eligibility criteria like educational qualification, application fee, Exam Pattern, etc and apply online from the official website. Candidates qualified in OUCET-2018 are eligible for admissions into Campus, Constituent and Affiliated colleges of Osmania, Telangana, Mahatma Gandhi and Palamuru Universities. Registration Fee: The registration fee for a single subject is Rs.500/- for OC/BC candidates and Rs. 375/- for SC/ST/PH candidates. For each additional subject, the fee is Rs.300/- for all categories. Payment of Registration Fee: The registration fee may be paid at any TS/AP Online Centres or through payment gateway (Credit/Debit Cards/Net Banking). Candidates can fill and submit the online application form from April 2018 to April 2018 without late fee. Students can make correction in the application form between May 2018 to May 2018. Candidates can submit the application form with the required late fee till the May 2018. Candidates are informed that the TS OUCET Exam Date 2018 will be announced through online and it will be placed on official website of osmania. Here we are providing some important dates of TS ou pgcet exam after officially published. Hall ticket is the mandatory document that is required for appearing the test. oucet 2018 hall ticket is being available online only. Applicants can download the admit card from our website. Candidates can also access the direct link from here to download the hall ticket. 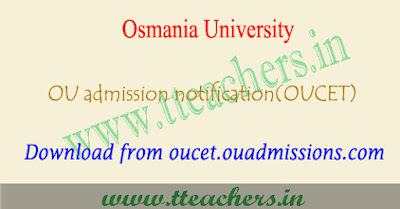 OUCET hall ticket will publish through online only, which will be released 15 days before the date of exam and placed on osmania pgcet website. Students are advised to preserve the hall ticket carefully till the completion of admission process. Unofficial answer keys will be published by various coaching institutes. Whereas, the official TS OUCET answer key 2018, is published later on by Osmania university Hyderabad. The candidates can check the answer keys in Sets of A, B, C, D. let us see the dates first and then let us move to how we can downlaod the answer key through official website. Telangana OUCET Exam Results 2018, ts ou pgcet rank card are declared at manabadi.com, ouadmissions.com, schools9.com. Candidates check their results, rank card and final answer key from here. Check TS OU PGCET Exam results 2018 at oucet.ouadmissions.com. OUCET Result 2018 will be declared in the month of June 2018. Students can check results, ranks at manabadi, Schools9 websites.